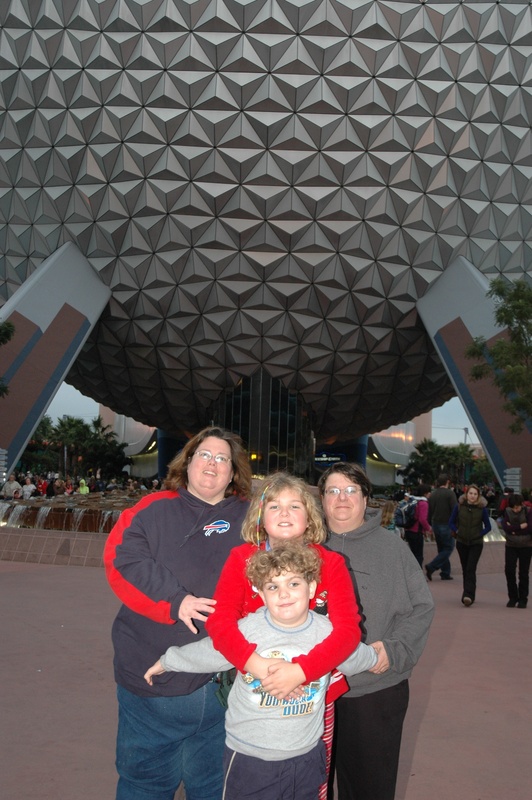 Pooh Sized Traveling – Part II Epcot Future World – What's for Dinner Moms? *Updated from the original post on October 15, 2016. We are a family of what is commonly referred to, in Disney Speak, as Pooh Sized people. I think of myself more Ursula sized but that is for another day. We love vacationing in Walt Disney World because they try to accommodate everyone when building their parks. My partner and I are Pooh sized, my son in autistic and my daughter and partner are hard of hearing. There are things in the parks to help all of us enjoy our time there with as little stress as possible. The first thing you notice about Epcot versus Magic Kingdom is that the gates to enter the park are wider. They do not have the old turnstile, as at Magic Kingdom (which have since been removed in Magic Kingdom), that was built before the average size of the American population went up. The Epcot turnstiles are wider in width and the turnstile bars are not too close together. If you feel at all uncomfortable about going through the turnstile you may ask to be let through the gate when you enter. The people at the gate have always been most accommodating to us. Spaceship Earth – This is one of my most favorite rides in all of Epcot. I love the general overview of history, the attention to details in the scenes and that it is a nice slow-moving ride. Size is not my issue here as much as leg room. I try to sit in the second seat in the car as there seems to be a bit of extra leg room. Not much but a bit. I get squirmy about half way through the ride and want to stretch my legs and there is nowhere to stretch them so I end up shifting from side to side to get comfortable as the ride goes on. Ellen’s Energy Adventure – Now this is my most favorite ride in all of Epcot. The first section of the attraction is a movie on three screens that you must stand for while viewing. There are a limited number of benches around the edge of the room but they are quickly filled once the doors open. Depending on when you arrive in the room and the start of the show it can be 10-15 minutes of standing still. After the movie you enter a second section of the show with giant cars and bench seating. The cars door are plenty wide enough and the bench seating allows you to sit comfortably. Sadly, or happily for some, this ride will be getting an overhaul soon to be Guardians of the Galaxy. Mission Space – Being a super chicken I have never personally ridden Mission Space but sent my 6′ 4″- 400 pound brother on it instead. He rode the green car and reported a snug fit but other than feeling incredibly nauseous he was fine with the ride. Test Track – This six seat open car is tricky. I do not ride it. But, others have comfortably. It depends on where you carry your weight. There is a test car that you can discretely ask to use to see if you fit. It is out of sight of the lines and if you do not fit there is a door nearby that you can exit through or you can rejoin your party. The Seas with Nemo and Friends – This slow-moving ride is reminiscent of the “Doom Buggies” from Haunted Mansion. As long as you or your child do not pull down on the bar as you are riding, the bars will lock into place as they are lowered, and you can leave plenty of room to be comfortable yet safe. Turtle Talk with Crush – Children sit on the floor in the front of the room and adults sit on long benches at the rear of the room. No problems here. Soarin’ – This ride caused me tons of anxiety. I carry most of my weight in my hips and thighs and knew that these seats are closely packed. We asked the cast members where might be the best place for me to sit and they recommended the last row on the end. As we passed each cast member I asked to be placed in the last row on the end. We placed one of our children between us so that if we “infringed” on someone’s space it was our own children. I had my partner help me with the seat belt before getting in her own seat as she could get a better angle on it. I fit! I was very glad I rode this ride. It was fun experience I was glad I was able to enjoy. Living with the Land – This boat ride has a small step down into the boat and bench seating. There were no issues with riding. The Circle of Life – This movie is shown in a tiered theater. The seats are approximately 16 1/2″ from inside armrest to inside armrest. What bothered us more than the seating in this theater was the volume of the movie. There are two people in my family that are hard of hearing and both of them were extremely bothered by the loud volume of the movie. So much so that we were forced to leave before the end of the movie. Journey into Imagination with Figment – This ride is made up of four cars that travel together that can hold 4-6 people per car. I prefer to sit in the front of the car because the second row seat door is much narrower than the first. I make this known to the cast member placing us on our numbers to get into a car. The doors can be narrow (reminiscent of The Honey Pots in Magic Kingdom) but if you turn sideways and step up and kind of lift your belly over the car door you should be fine. The seating once in the car is a bench seat without a bar closing over your lap so there are no problems. Disney & Pixar Short Film Festival – The seats are approximately 16″ inside armrest to inside armrest and 16″ deep. This theater is usually not crowded so you can generally leave an empty seat between you and the person next to you to feel more comfortable. This is probably my least favorite attraction in Epcot but it has air-conditioning and seating on a hot and weary day. We love Epcot and it has to be our favorite at this point in our lives. *This blog post has been moved from “Earning My Disney PhD” my second blog which I will be closing shortly. It was originally posted in 2014. Our happy place! We love it. As our “Casey” (Kevin Christopher Jr) ages, the noise factor becomes more apparent. As I age and gain more weight, you address a lot of issues I hadn’t thought about. I am starting to take note of airline seatbelts and general seating as they try to squeeze more and more rows of seats onto a flight and charge premium prices for what use to be regular aisle seats, front seats, leg room and other things that are necessary to us older folks as we travel and want to avoid blood clots. Theater seats, especially in older theaters, are also a problem. Thanks for praising WDW and Epcot and bringing this supersizing of America to the attention of those who would restrict us. Noise canceling headphones are a God send if Casey doesn’t have them. They are great in loud places and more and more people,are becoming aware as they see them. PS – Do not believe the time it was posted! I am a night owl but it is only 9:32 pm! Lol. The company is overseas so time is 4 hours ahead. Sounds like a wonderful place Marci!